You will also need a deep fat/oil fryer - if you don't have one, just get a wok and a whole heap of cooking oil, like 2 L or so. "Scald" the milk in a pan; cool to lukewarm. Soften yeast in the warm water. Allow to set for 10 minutes until bubbles form. Add salt to milk and yeast. Combine yeast mixture, sugar mixture and flour together alternatively. Stir until smooth, but don't stir too much. Cover with plastic wrap and let stand in a warm room until it doubles in bulk (roughly 1 hour). Put it in a fridge for 1-2 hours until it roughly doubles in bulk again. Roll 1/2 inch thick on a lightly floured surface. Cut with a donut cutter (or a large cup and a bottle cap if you're cheap like me!) into donut shapes. Let them sit [on wax paper] for a few minutes (this forms a skin that helps the donut not to crack... apparently) while you prepare the frier. Fry donuts in deep fat/oil frier (180°C for 30-60 seconds - the oil should not be smoking, but a small amount of batter should fizzle). Try using a spatula to lower the donut into the oil without splattering. Use the hit+shake method to get most of the oil off the donuts when taking them out. Remove from oil and place on paper towels to soak up as much oil as possible. Allow donuts to cool, and glaze with the glazing below. Eat, and go nom nom nom :3! Melt chocolate chips by placing them in a bowl surrounded by hot/boiling water and stirring. Add just a little bit of icing sugar and hot water until you get a good consistency. The more icing sugar you use, the more the final result will be like icing; the less icing sugar, the more it will be like crunchy chocolate. 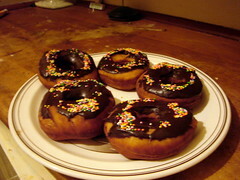 Dip cooled donuts into chocolate, and then dip into a smaller plate with a layer of sprinkles. After a while your smaller plate will probably start to accumulate chocolate. I have no idea how to do this any better! Page updated 14 September 2007.